Samsung Galaxy Note 9 vs S9+: what difference does $160 make? The new Galaxy Note 9 may be designed to rival the future large format iPhone, but the Galaxy S9+ itself is certainly one of its biggest competitors. Both smartphones have a lot in common. But which one should you buy? Is the new S-Pen enough to seal the deal? Find out in our article. This year Samsung played the safety card. Last year, with its S8 and Note 8 models having met with great popular success, the South Korean manufacturer did not want to change a recipe that works. On these two flagship models, the modifications were minor compared to their previous models. As a result, again this year, the two great smartphones made in Samsung are very similar. Thus, in terms of technical specifications, we have two more or less equivalent products. Both devices have the Snapdragon 845 chipset (or Exynos 9810 in certain regions) coupled with 6 GB of RAM. Same thing for the camera with a dual 12MP camera with variable aperture between f/2.4 and f/1.5. To say a few words about onboard displays, the Galaxy Note 9 and Galaxy S9+ offer Super AMOLED displays of a size of 6.4 and 6.3 inches respectively, with resolution at 1440 x 2960 pixels. Enough to satisfy the fans of big screens either way. Talking about the finish, both smartphones (or phablets) use the same materials as the current Galaxy S8+ and Note 8: metal and glass. In addition to a very similar look, the other common point between the two smartphones is the software interface. Android Oreo is available and the Samsung Experience overlay is also up to date. An update to Android Pie should be part of it but you will have to be patient in both cases. It's hard not to talk about budget when you're deciding between the two models. 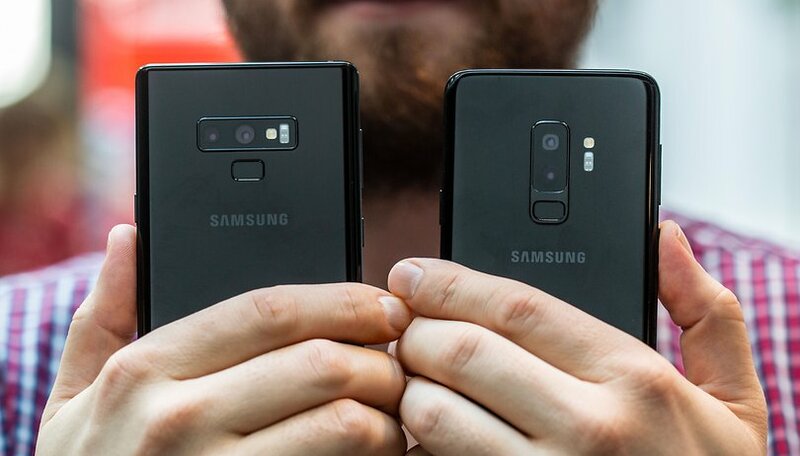 In our case, the difference between Galaxy Note 9 and Galaxy S9+ is quite significant. Indeed, the Galaxy S9+ is priced at $839.99, $160 less than the Note 9 sold at $999.99. And that's a 64 GB S9+ vs a 128 GB Note 9. The 128 GB S9+ is only $110 less at $889.99. Nonetheless, the price of the S9+ is sure to drop long before the Note becomes cheaper. Why go for the Samsung Galaxy Note 9 then? This is a legitimate question to ask as the two devices are so similar and the price gap is daunting. Two reasons are to be put forward for the Galaxy Note 9. Unlike the S9+, the Note 9 has the advantage of carrying an S-Pen stylus that increases software possibilities tenfold on a large screen. Especially since this year Samsung has worked hard to improve the capabilities of its S-Pen. The accessory now has a battery and Bluetooth connection for communication with other devices. It is also possible to control your music, trigger a photo, unlock and lock the phone, interact with applications, double click... In short, the S-Pen is a real asset. In addition, the Galaxy Note 9 has a 4000 mAh battery, about 14% more than the 3500 mAh battery found on the S9+. While we haven't yet checked the endurance of the terminal yet, Samsung's many teasers for Note 9 suggest that the battery will be an important selling point for the smartphone. If the S-Pen is an indispensable accessory for you, the Galaxy Note 9 is probably the smartphone you need. If its price impresses you, it is always possible for you to wait a few months to acquire it at a more attractive price. For the rest, with the exception of its battery, Note 9 has little to offer compared to the proven S9+, which now enjoys a more attractive price tag for the same result. In the long term, one can wonder about the future of the Note range, especially if the S-Pen can become an independent Bluetooth accessory as my colleague Shu suggested. Which smartphone appeals to you the most? I really like the note, especially the 8gb model with half a TB of storage. For myself, I would choose the 9+ due to it's compact size. It's a little smaller than my 8+ which I still enjoy very much. Watching video's on these 3 phones is an extreme pleasure! I love great display's!